Rye River is one of those brewing companies that I reckon is going to grow significantly in the coming years. It was founded in 2013 in a little Kildare commuter town to the west of Dublin called Kilcock. In fact, Kilcock had a rich brewing heritage with 3 breweries and 2 malthouses. There were also 6 distilleries in 1776 taking full advantage of the Royal canal. Rye River is housed in what was once Kelly's bakery from 1700s to the 1980s. It's a prominent industrial building in the centre of the town. It would appear that there had been plans to demolish the old building and create a new town centre development in 2006. Thankfully, the recession put an end to that madness and Rye River made it their home 7 years later. So, why will Rye River go places? It's all about the staff. Most microbreweries in Ireland are set up by beer enthusiasts. People with a passion for good beer and usually with a home brewing background. The trio of Niall, Tom and Alan come from big beer. They know how to market beer which already gives them an advantage. With experience in the likes of Molson Coors, Guinness and Heineken under their belt, the founders have plenty of experience in the industry. They also employ talented brewers like Alex Lawes to keep things interesting. Rye River has a number of brands under their belt. There's the marmite brand of McGargles. You either love it or hate it. Personally I'm pretty ambivalent towards it, the problem is the branding rather than the beer itself. McGargle's isn't really aimed at die hard craft beer drinkers. It's a much more accessible brand and quite literally, the bread and butter of the brewery. I quite like the Knock Knock Ned's IPA but it wouldn't be top on my list. Some of the other brands are Solas, The crafty Brewing Company and also Colgan's. They briefly released some extraordinary beer at recent beer festivals under the Rye River brand. A wonderful American brown ale, Berliner Weisse and DIPA. They now have another brand of beer called Grafters and has just been released. A bottle of each beer was left at the brewery for me to collect and give my opinion. 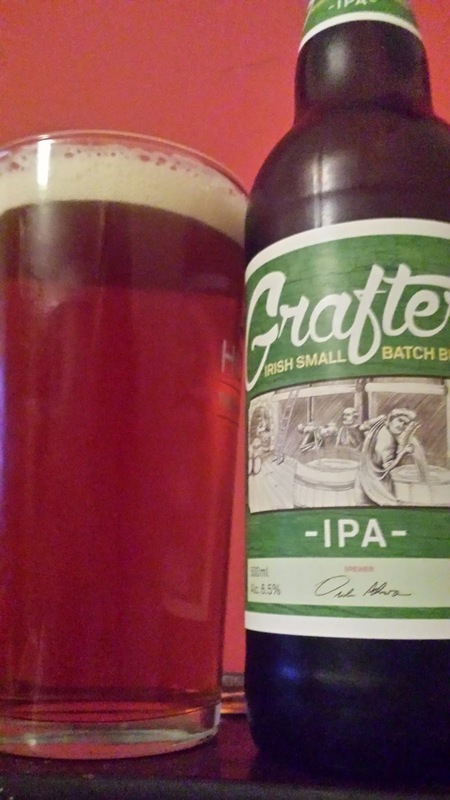 Grafters IPA is a 6.5% IPA with plenty of grapefruit on the nose. On tasting, there's a real caramel. body hit along with citrus. It's quite bitter but there's a nice sweetness to keep it balanced. Easy drinking and clean. There's not much aroma but it's tasty enough. It's a little bit like a starter IPA. It won't scare the hop sensitive like a big American IPA of the same ABV. Grafters pale ale is the baby brother at a sessionable 4.5% and you know what? It's a much better beer in my opinion. An aroma of caramel, grapefruit and toasted malt. The flavour is where it really shines. Bitter up front, more so than the IPA. Then, a little caramel sweetness. A burst of citrus follows, grapefruit and orange. It's a little thin but that's just making it really refreshing and an excellent session beer. There's a slightly sea salty bitter finish? I can't be sure about the salt, it wasn't there in the IPA and I used the same glass so I'm not sure where the salt came from. It was just the barest hint and it actually worked really well with the beer but it could have been anything and may not have been in the beer at all. So, two new beers from Rye River and they are pretty decent to boot. I just hope they release the 3 stunning Rye River branded beers I mentioned earlier. It would give them some serious street-cred among some of the more snobbish beer drinkers. I count myself among that crowd sometimes. 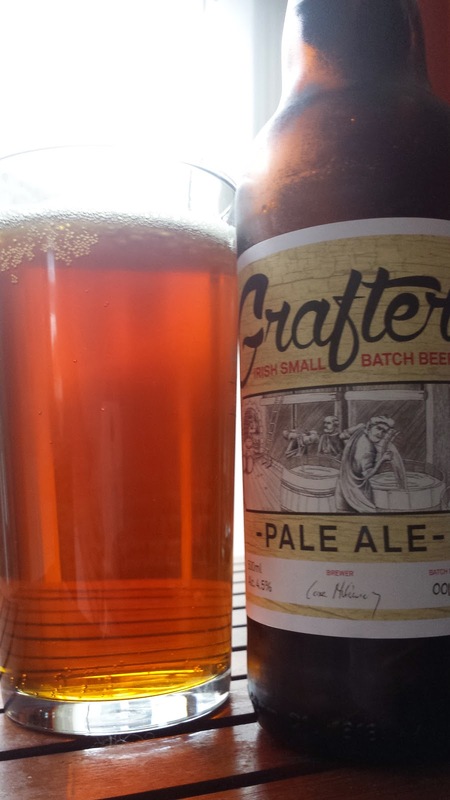 Grafter's Pale Ale is a very nice Irish craft beer and, at €1.95 in Dunne's and other shops it's got to be the very best value. 4.5 out of 5.
absolutely great value for money, craft beer usually means more expensive but yours is value for money.I buy it in Dunnes stores Enniscorthy. I have never had the oppotunity to try the Grafters IPA 6.5 as i have not seen it for sale in my home town. If you want to send me a sample I will not refuse !!!! !